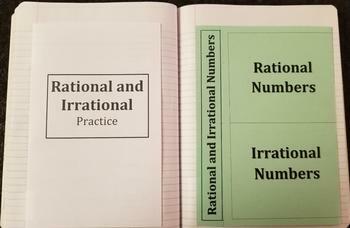 Introduction to rational and irrational numbers. The guided notes provide definitions and examples of each. 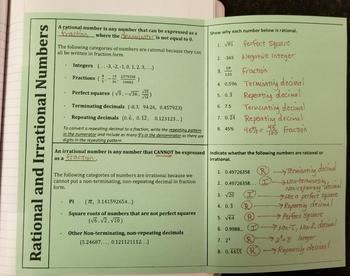 It also provides space for students to identify and explain why various numbers are rational or irrational. 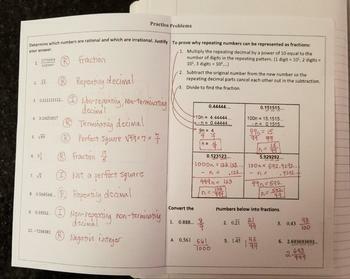 The practice page includes additional problems and shows students how to convert repeating decimals into fractions. These two foldables are designed as to be easy additions to interactive student notebooks (ISNs). With simple folding and no cutting, this makes teacher prep time a breeze and saves valuable class time. One sheet is a guided notes page and the other is for independent practice. Using colored paper for the guided notes foldable is optional.